iPhone is one of the most popular smartphones available in the market right now. The iPhone app store has more than a million apps and sometimes it becomes hard to find some good and interesting apps. Today we will show you some of the coolest iPhone apps that are relatively new and you’ll enjoy them.The apps we selected are released in past one or two months and are an absolute must to give a try! Big City is a city-building game from the creators of Tiny Tower and is one of the coolest iPhone apps. You can make a city as big as you want and how you want. You can make your dream city in this game with the cars of your choice, planes you like and ships you always wanted to see. You start small in Big City and then you continue to grow your city. You can keep adding new cars, new buildings, and new planes to further grow your city. The more you keep playing the game, more you keep unlocking the new buildings, cars, and other amazing things. All you have to do is tap and drag items and with some thousand taps, you can make your dream city the way you want. You can download the Big City game here. AddMe Pro is a friends finder app. It lets you easily find friends on Kik Messenger and Snapchat. It also lets you find thousand of followers on your Instagram. Finding friends is a very easy job with AddMe Pro. This is one of the coolest iPhone apps and lets you be friends with strangers. It has a lot of Kik, Snapchat and Instagram usernames which are published by the people themselves so that other people can find them. The service is free to use but you have to pay to be a pro member and unlock some new features. The Pro membership will cost you $19.99 a month and will keep auto-renewing until you cancel the subscription. To know more about the app and download it, go to the Apple App Store. OXENFREE is a supernatural mystery graphic adventure video game. It was first released on PlayStation 4 and on Xbox One. And now is available on iOS. It is one of the coolest iPhone apps available. In this game, you play as Alex, which is a bright, rebellious girl. Alex can talk to the supernatural using her radio and there are a lot of mysteries to unravel. To know more about the game and download it, go to the App Store. Ticket to Earth is an amazing mash-up of three popular genres of games, the puzzle, RPG and strategy. It is a sci-fi tale of betrayal and insurrection. The game has a unique art style and every stage has its own primary objective. If you want more challenge, you can always go for the secondary objectives. Each level has a grid of different colored tiles. You can move your character by selecting it and dragging its way. You earn tokens for completing each objective and then you can spend these tokens to improve your talent tree which will make it easier to progress in the game. To know more about this app and download it, go to the Apple App Store. Kingdom: New Lands was initially released on Steam and Xbox One. It was then released on iOS and Android. It is a simulation/survival game developed by Raw Fury. The game received excellent reviews from a lot of big blogs and different critics and is one of the coolest iPhone apps. You have to be brave to rule the world in this game. You have to fight till the end and conquer the New Lands. You also get a horse and you have a bag of coin. Greedy creatures will try to take your coins and you have to stop them. The game also has a beautiful, award-winning soundtrack. To know more about this game and download it, go to the Apple App Store. Beglitched is a game about the securities which are present in today’, online world. You have to survive in the world of clowns, leftclickers, and filedraggers. The game costs $3.99 on App Store. The game received amazing reviews and is one of the coolest iPhone apps right now. 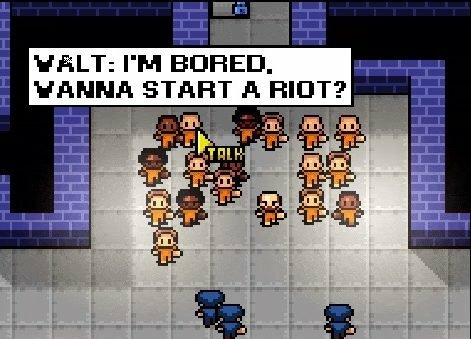 The Escapists is a multi-million selling prison escape game. It was first available on Windows and Xbox and now it is available for iOS as well. In this game, you land in a prison and now you have to break it and escape by any means possible. You can use any means to escape the prison, there are no limitations or restrictions. You can cause a riot among other prisoners or dig a tunnel or break a wall. It is all up to you and you can escape by using any means. You’ll be landed in most secure prisons around the world and you have to escape each one of them by using your escaping skills. Guns of Mercy is a combination of shoot and arcade. The game is set in the era after the great war against the alien invasion. There are enemies everywhere and people started to live underground to protect themselves. You have different types of weapons including Buster and Gatlin which you can use to destroy the enemies. You earn gold and gem to upgrade your capacities. There are a lot of missions (100 levels to be precise) and a lot of crazy monsters which you have to defeat. Plus, the game has simple and precise controls. Did you like our list of the coolest iPhone apps? Which app or game did you like the most? Left us a comment in the section below!